Stuttgart Airport is the gateway to the marvelous German city of Stuttgart. In 1945, the United States Army took over Stuttgart Airport and only returned it to German authorities in 1948. Stuttgart Airport was expanded after World War II. Stuttgart Airport (IATA code: STR) is the international airport of Stuttgart and an important hub for Eurowings. Flights to StuttgSart Airport are provided by international airlines such as Turkish Airlines, South African Airways and British Airways. STR is a 16-minute drive from the city centre of Stuttgart. Book your cheap flights to and from Stuttgart Airport online! Stuttgart Airport is christened after Stuttgart’s former mayor, Manfred Rommel. 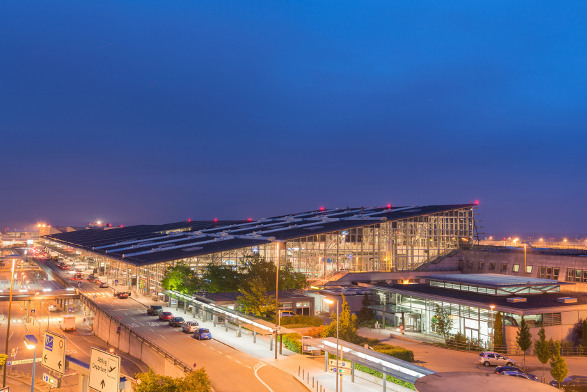 With 10.5 million passengers passing through its doors in 2015, Stuttgart Airport is the sixth-busiest airport. The airport underwent rebranding, publicly changing its name from Flughafen Stuttgart to Stuttgart Airport. The airport lies on the boundary of Stuttgart and the nearby town of Leinfelden-Echterdingen. Discover a great range of food and drink choices at Stuttgart Airport. Airport patrons can enjoy a variety of cuisine at the cafés, bars and restaurants. Shop at Stuttgart Airport and discover amazing books, souvenirs, clothing, tobacco and the incredible world of duty-free shopping. Stuttgart Airport has revitalising lounges in their departures terminal, including Air France Lounge, Elli-Beinhorn Lounge, Lufthansa Senator Lounge and British Airways Executive Club Lounge. There are a great range of facilities at Stuttgart Airport, including banking, an information desk, a conference centre and accommodation. This 3-star hotel is an innovative means of Stuttgart accommodation. It is a 15-minute drive from Stuttgart Airport. Amenities include a fitness centre, free internet, parking and a breakfast bar. This Star Inn Hotel is located near the exhibition grounds and it is a 5-minute drive from Stuttgart Airport. Amenities include meeting rooms, a bar, free Wi-Fi, and free airport shuttle. This luxurious and comfortable hotel is a 5-minute drive from Stuttgart Airport. Amenities include parking, free Wi-Fi, a 24-hour business centre and an airport shuttle. Travellers can order foreign exchange at least 60 days before departing from South Africa. Stuttgart Airport has an incredible range of parking options, including short-term and long-term parking. Book online and save money! Stuttgart Airport is located 13 km of Stuttgart’s city centre. Metered taxis, airport shuttle, buses and car hire options are available to transport you to your destination.